It had long, puffy sleeves with a cuff at the end, pleating from the yolk (which made the dress pretty shapeless), and an awkward length just below the knee. The collar felt pretty outdated but there was something I actually loved about it, so I decided to leave it until the end to see how it looked. 1. Cut sleeves off at the shoulder seam and finished off. 2. Brought the length up a few inches to just above the knee. 3. Made a thin waist tie with the excess fabric from the bottom hem. Here is the finished result! I absolutely loved the collar once I was finished with the rest. There was no way I was going to change it. OMG!!! That collar is a must! Definitely a keeper! The dress turned out SO pretty!!! I love to check in and see the dresses you re-fashion. Totally inspiring! You are adorable and I love your new haircut. Thank you so much!! Made my day. 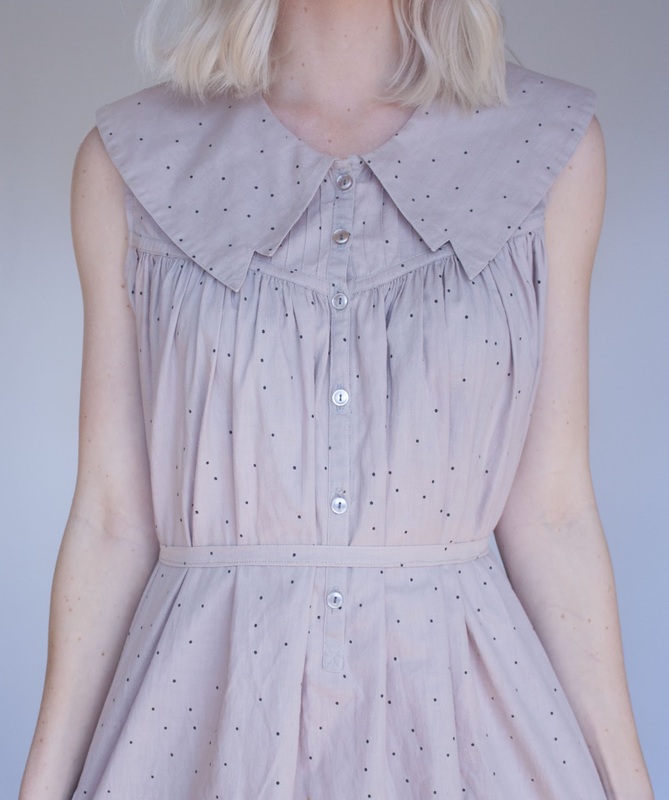 Gorgeous refashion! You are very talented!